Developed by English handwriting masters in the 18th century, copperplate calligraphy is admired for its fluidity and beauty. It is the most popular style for social correspondence, invitations, and other communications requiring an elegant hand. In this practical manual, a noted calligraphy teacher offers a comprehensive, step-by-step guide for the student. Beginning with a brief but fascinating history of copperplate, she moves quickly to an in-depth examination of the alphabet, numbers, and punctuation. Each letter is demonstrated stroke by stroke with a clear explanation. Readers will also find detailed discussions of writing in color, using the proper paper, and learning how to retouch, correct, and crop. Ms. Winters then shows how copperplate can be used to write a simple paragraph, a short quotation, or poetry, and explains how to use the script commercially for addressing envelopes and writing name cards and invitations. With this easy-to-follow manual and some practice, calligraphers will be able to create copperplate scripts with the rhythm, grace, and ease of the great writing masters. From the Back Cover Developed by English handwriting masters in the 18th century, copperplate calligraphy is admired for its fluidity and beauty. It is the most popular style for social correspondence, invitations, and other communications requiring an elegant hand. In this practical manual, a noted calligraphy teacher offers a comprehensive, step-by-step guide for the student. Beginning with a brief but fascinating history of copperplate, she moves quickly to an in-depth examination of the alphabet, numbers, and punctuation. Each letter is demonstrated stroke by stroke with a clear explanation. Readers will also find detailed discussions of writing in color, using the proper paper, and learning how to retouch, correct, and crop. Ms. Winters then shows how copperplate can be used to write a simple paragraph, a short quotation, or poetry, and explains how to use the script commercially for addressing envelopes and writing name cards and invitations. 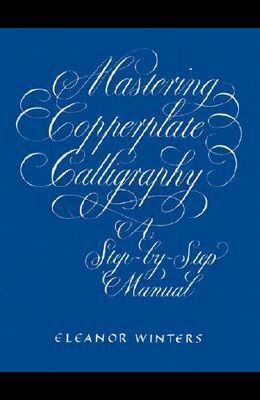 With this easy-to-follow manual and some practice, calligraphers will be able to create copperplate scripts with the rhythm, grace, and ease of the great writing masters. Unabridged Dover (2000) republication of the edition published by Watson-Guptill, New York, 1989.